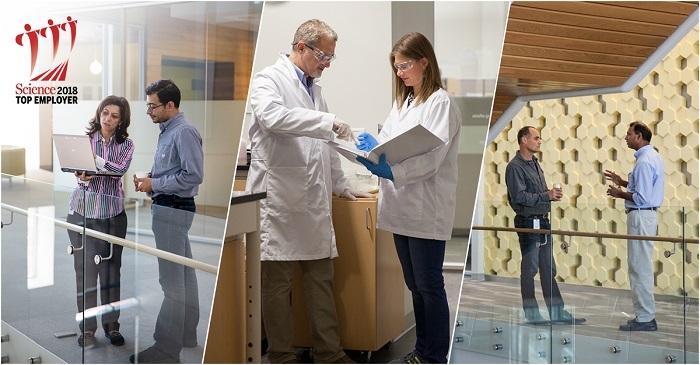 RESEARCH TRIANGLE PARK, N.C, USA, Oct. 26, 2018 — Syngenta has once again been recognized as one of the world’s leading biotech employers in a survey conducted by Science magazine. The company ranked 14 out of 20 top employers in biotechnology, biopharmaceutical, pharmaceutical and related industries. The annual Science Careers Top Employers Survey identifies companies with the best reputations as employers, based on 23 characteristics. Syngenta was acknowledged for treating employees with respect, having work culture values that align with their employees and being socially responsible. The findings are based on 8,015 completed surveys from Science magazine readers and other survey invitees. Syngenta is dedicated to helping crops reach their full potential, with a robust R&D investment and pipeline that enables researchers to develop seed trait technologies that are beneficial to farmers, consumers and the future of agriculture. The company maintains biotechnology and seeds research operations globally, with centers of excellence in Research Triangle Park, N.C., and Beijing, China. With The Good Growth Plan, Syngenta aims to improve the sustainability of agriculture through a series of measurable commitments, which include making crops more efficient. “We aim to be the most collaborative and trusted team in agriculture. This award is great recognition of our culture and how Syngenta nurtures passion and teamwork to achieve growth for all, making us an attractive employer,” said Laure Roberts, head of human resources, Syngenta. This is the ninth year Syngenta has ranked in the survey as one of the top 20 companies. The complete rankings of the 2018 survey can be found at the Science magazine website. For more information about biotechnology and seeds research at Syngenta, visit www.syngenta-us.com/biotechnology. Join the conversation online – connect with Syngenta at Syngenta-us.com/social.